IslandGirl and MortemVetus are proud to present Grave Expectations, bringing undead life to your M4's and V4's. This pack contains a massive 160 poses (80 for M4, and 80 for V4) to get your zombies shambling, crawling and digging themselves up! Each of the M4 and V4 sets contain a wide variety of zombie poses for those who are already up and about, as well as 24 poses in each set relating to zombies climbing out of their graves. 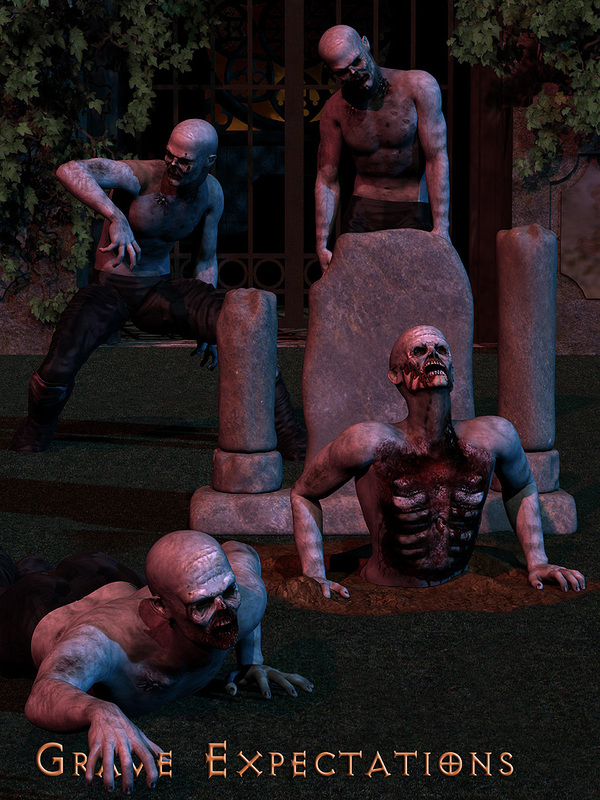 For the zombies that are unearthing themselves, there is a morphing Grave Plot figure, which contains specific and individual morphs for each of the 48 poses that interact with the ground. It also contains an additional 2 morphs for 'Freshly Buried' and 'Freshly Risen'. The Grave Plot has 5 smart propped Headstones and a selection of MAT poses, for different amounts of disturbed earth.